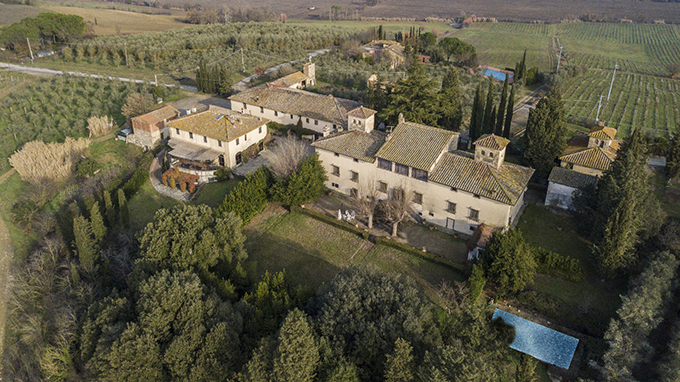 This magnificent 16th-century villa for sale, once owned by the Rosselli del Turco noble family, is on a high, very panoramic position on top of a hill a few minutes from Florence, in the renowned Chianti area. This complex not only includes the main estate and its exclusive swimming pool, but also an active farm producing high-quality wine, and a popular restaurant located in the old farm-barn. This property's farmhouses and its wonderful villa are currently home to a tourist accommodation facility offering guests spaces designed with great care. The villa is home to refined 17th and 19th-century furniture and high-quality details such as coffered ceilings and enchanting frescoes. The living area directly overlooks the garden, while the sleeping area, located on the "piano nobile", is composed of five bedrooms with period furniture, a living room with a fireplace, a living room with a piano, and a billiard room. The farmhouses offer a more rustic, typically-Tuscan atmosphere with bright, cozy rooms equipped with all comforts; they are home to 10 apartments, which have a private swimming pool. This property is surrounded by a lovely garden adorned with centuries-old trees offering shade, privacy and a view of the vineyard. Behind the house there is an intimate terrace, the perfect place to have lovely "al fresco" meals when the weather is good. The garden is also home to a historical chapel which may be used for religious functions. This is the perfect place to spend relaxing holidays while surrounded by nature, in the privacy offered by these untouched lands; but this charming Tuscan farmhouse is also a perfect home throughout the year, as it is close to the city and all its services. In the province of Pistoia, there is this wonderful farmhouse surrounded by Tuscany's lovely hills.